"New Yooooooooooooooooooork, concrete jungle where dreams are made of, there's nothing you can't do..." ~Alicia Keys (Empire State of Mind). Wherever you live, you have to admit: one city in the world has an allure like no other. New York. The city that never sleeps, rich with culture, diverse with people and attitudes. The city seems to crackle with possibility and and I don't think there is a person out there who doesn't find the thought of living there - or at the very least visiting it - extremely appealing. So, is it any wonder then that it wasn't the variety of personas Ruth Reichl morphed into or the detailed descriptions of the meals she enjoyed at the various restaurants, but the locale of her book, Garlic & Sapphires, that inspired me most? The street scenes, the buzz of the city and its hidden treasures all come to life in Ruth's account of her time spent as the New York Times' restaurant critic. I wanted to inhale the very essence of the city whilst reading and in fact, I could almost smell the Manhattan air as I did so. Something quintessentially New York was therefore the no-brainer choice for my first This Book Makes Me Cook challenge. Cheesecake, bagels, lox and cream cheese were all contenders for the crown, but the winner was a NY classic - pastrami on rye. 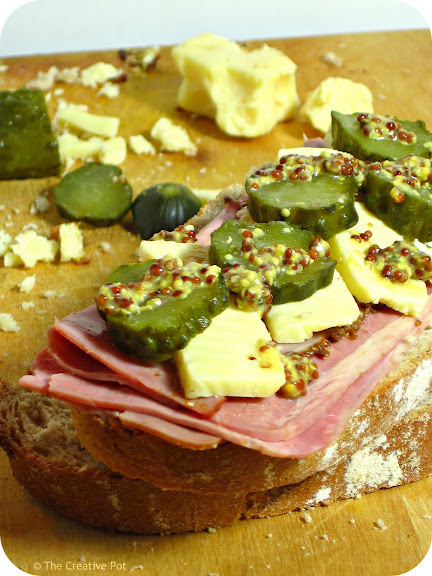 Soft, fresh rye bread, paired with a dab of mayonnaise, a couple of slices pastrami, nutty emmenthal and sour pickles and garnished with dribbles of coarse grainy mustard. The perfect portable meal for the get-up-and-go lifestyle of the locals. And if you haven't read the book in question, I can think of no better partner for this sandwich. PS: Doesn't this excerpt from the book just encapsulate the very essence of the joy of cooking? 1. Lightly spread both bread slices with mayonnaise. 2. 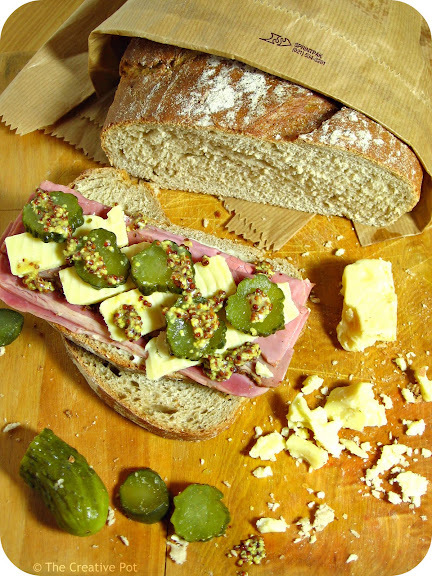 Layer the pastrami, emmenthal and pickle onto one of the bread slices. 3. 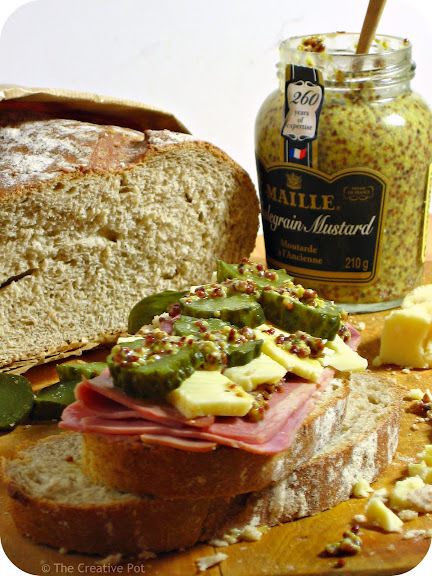 Add dollops of mustard here and there and top with the other slice of bread. Foodporn first thing on a Monday morning is not a good thing...or is it???? Fab photos and Divine sandwich!!! Luv this post - PRETTY PRETTY pics too. Michael - thanks! This is my new favourite sandwhich. Well, I don't know if you really want to SMELL the streets of Manhattan, but you certainly do want to taste the food here! Pastrami on rye is classic New York. This looks fantastic. If you ever come visit, you'd better let me know because then we have a date at Katz's Deli...the ultimate stop for some really good Pastrami in NYC. Wish I'd had that for lunch instead of a dodgy lasagna I bought from Melissa's. Joanne - Katz is definitely on my to-visit list for one day; seems the place is quite legendary. Koek - I wish I had this for lunch too! But alas, no more pastrami. Strange about Melissa's though - their food is normally quite good quality. :P""""" that's gorgeous! I can almost taste it from here...wishful thinking. Wow, you have a delicious spot here...I must go explore! And I LOVED Garlic & Sapphires...all of Reichl's books, actually. YUM! Girlichef - Thanks for stopping by. Haven't read any of Reichl's other books, think I should look them up in the library! Umm Mymoonah - I repeated these sandwiches about two days afterwards, so much did I enjoy them. I LOVE pastrami! The husband is the rye fan though, this looks awesome, thanks! There's something about your pickles in that first photo that gets me excited. Also, that mustard taunts me from an ad on a bus shelter by here every day of my life. How good is it? All in all, a very delectable choice ;). This looks divine! Make me one and deliver, please? I have no lunch today! Kurioskitteh - I'll be honest, this coarse grained mustard is the only one I'll eat. I hate the smooth stuff! Simply Life - Thank you! Polkadotcupcake - We'll have to do lunch someday and I'll make these, mkay? Simran - Thanks Simran, awesome to be a part of it. As a New York Bagel addict for the last 15 years, this is something I can eat ANYTIME. I love to make my own and the family get just as excited when I do. Served with coleslaw - even better! Rose - I almost made bagels. That's next on my list of things to make. Lovely review and a great sandwich.I have never had pastrami on Rye but I am waiting to visit NY and Katz to have the ultimate!! Welcome to the book club. :) Off to check out Mesir Wat.